I’ve been busy, busy, busy putting my new iPad Pro through its paces since I picked it up this morning. Too busy to even blog about it, in fact! But I did shoot some video of the unboxing, setup, and my first flight with it, through a bunch of apps that make perfect sense. Sit back for all 45 minutes. The Kindle app works OK, with two-page spreads. But the layout looks a little bit “off” due to the app not being optimized for the larger screen. iBooks looks much better. The sound from the speakers is amazing. Sure, because it’s big enough to produce actual stereo separation (and unlike other iPads, actually has stereo speakers). That said, the sound is surprisingly rich. 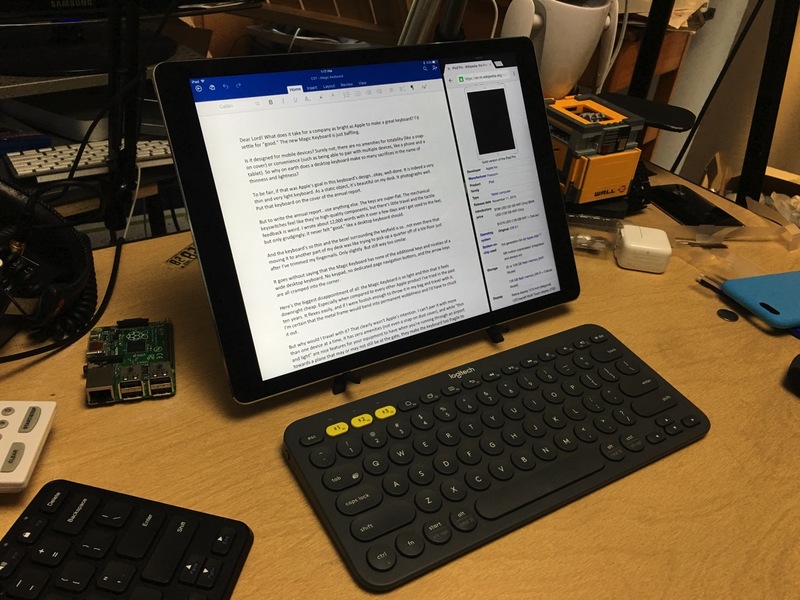 When I paired with a Logitech bluetooth keyboard and set it up on a stand? Oh, baby! iOS on a big screen and in a desktop context feels so very right. Substantive opinions will have to wait until I’ve got a lot more stick time in with the Pro. But the iPad Pro made a great first impression and I had a fine first day with it, which included using it to edit (and partially shoot) the unboxing video. They didn’t have any Apple Pencils or Smart Cases, except for display. That wasn’t surprising. The night before, I’d expanded the search in the Apple Store app to all of New England and even New York, and didn’t find a single store that had the Apple Pencil available for in-store pickup today. Yer Scone intro is all in my left ear. I preordered mine this morning (launch day) and went in to pick it up at the Derby St store when they opened. The very nice guy who checked me out said that they had no idea until they showed up for work this morning that the iPad Pros were going on sale today. There were no floor models available and he said that he still hadn’t seen one out of the box. There was no sign of a pencil or smart keyboard cover, although I saw another customer with the Logitech cover, and I got the rubbery Apple case. (Neither was available on the sales floor.) All that taken together, plus the fact that it was a federal holiday, he said it was a very atypical product launch. The location in Fairfax VA had all colors and all models in stock. They wouldn’t let you just walk in and buy them, but you could stand outside on your phone, pre-order, and then walk in. I was really shocked that he apple pencil wasn’t available. That really should be hand and hand with the Pro. If they are going to talk it up that much then it has to be available. That was the selling point for some. I snagged the Logitech Crete keyboard and love it. Solid choice. I wasn’t going to get one until your unboxing video this morning. Went over to the local Best Buy and they had a few in stock, another gentleman was purchasing one when I got there. No luck on the pencil, they did have a few of the smart cases, but I opted to go bare for awhile until the reviews come out for the cases. I’ve been using it nonstop since I got home. I wasn’t sold on this concept, but man…this is the best iPad I’ve ever used. I’m a photographer so it will never, well maybe never, be able to replace my MBP, but it can do just about everything else with ease. I ordered online and picked it up at an Apple Store in Westchester, NY. I don’t think they had any stock outside of preorders and the sole demo unit was untethered and being carried about with a keyboard case and the pencil. Really a low-key launch; no announcement, no in-store promotion, no “Designed for Pro” category in the App Store. I had the chance to very briefly use said Pencil and keyboard case. The Pencil is “Weee!” and the keyboard is something less. Perfectly happy today using an old Apple keyboard and am Amazon stand, but I would at least like to get a sleeve or something to keep it alive and unshattered during the daily commute. Semi-related note: I’m thrilled that Andy’s rolling here again. Great to move the site up the bookmark list back to its proper campsite next to Daring Fireball and the Loop. Great sound! Waaaah, no Pencil, though. Oy, yes. A lot of people feel like they got an Xbox for Christmas and the controllers are arriving in 10 to 22 days. It’s on that list of “stories I hope that get told someday.” I don’t see the limited stock as a failure, or a cunning plan to make it seem elusive and exclusive. I think they haven’t really figured out exactly who will buy it (fair enough), and thus were conservative in their shipments. Got so excited about playing with the iPad that I didn’t eat the scone until after dinner. Even after just two days of use, after five years of using iPads, it’s clear that the iPad Pro is a new style of computing. I’m using it in ways that I never used my iPad 3 or my Mini. Logitech Create arrived in the office today. I’m puzzled by Apple’s choice of “official” keyboard case. Everything about the iPad Pro says “use me like a real computer” except that Smart Keyboard. I suppose Apple knew that Logitech (et al) would make a wide range and they were therefore free to make something that looks like a member of their design family. Must’ve been hard on those employees…having to set all of that stuff up just in time. On the keyboard, it might just be a case of only having so many engineers and designers available. Given how many products large and small Apple has released recently, and given that the Pro is likely a niche product, they might have decided that ‘good enough’ was good enough for the keyboard. I figured to wait until a third-party came out with something special, but I’ve been rather happy with the Pro on a Compass stand and an old Apple keyboard. Being able to move the display around the desk independent of the keyboard is a plus. Love your unboxing, it was fun and funny while being informative. Thanks. Previous PostPrevious iPad Pro – Bought!